Once upon a time, it was thought that doing nothing about our unsustainable use of fossil energy would cost us nothing. Doing nothing was free, it seemed, but action might be costly. We now know (from unprecedented storm surges, continent-wide rashes of wildfires, tornadoes, floods and crop failures, food price spikes, and record disaster relief spending) that inaction is unaffordable. As impacts from accelerating climate destabilization mount, the cost to society will not be limited to flooding, drought, wildfire, crop failure and disaster relief spending. They will also include severe stresses on long-term fiscal solvency, pervasive and compounded challenges to what we consider to be routine economic activity, and real and daunting security challenges on an unprecedented scale. There will also be added costs from the collateral degradation of human health. As food prices rise, crop productivity declines, and major flows of economic goods and services slow down, are diverted, or experience sporadic but serious and repeated interruptions, the human health impact of dislocated climate systems, heightened risk of allergy and disease over a wider area than we have known, historically, and air and water quality issues, will be compounded. The result will be a steady increase in the health-cost burden directly associated with climate destabilization. And these specific cost considerations will be of primary importance only so long as vital life support systems remain more or less intact. If we see more major freshwater lakes drying up, as we saw in January 2014 in China, due to chronic pervasive drought, if river systems and major forest ecosystems, continent-wide colonies of pollinating bees and temperate-zone farming climates, unravel, migrate or cease to exist, we will face costs that far outstrip the entire value of all monetarily measurable economic activity. Nature will, of course, persist, but those aspects of our relationship with natural life support systems, which make our global civilization viable, may be so severely stressed that all economic precedent becomes functionally obsolete. 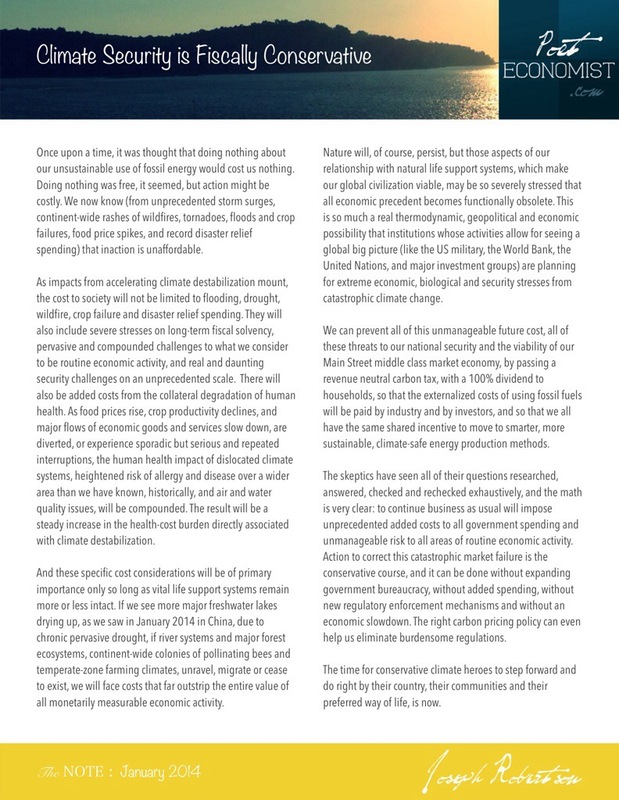 This is so much a real thermodynamic, geopolitical and economic possibility that institutions whose activities allow for seeing a global big picture (like the US military, the World Bank, the United Nations, and major investment groups) are planning for extreme economic, biological and security stresses from catastrophic climate change. We can prevent all of this unmanageable future cost, all of these threats to our national security and the viability of our Main Street middle class market economy, by passing a revenue neutral carbon tax, with a 100% dividend to households, so that the externalized costs of using fossil fuels will be paid by industry and by investors, and so that we all have the same shared incentive to move to smarter, more sustainable, climate-safe energy production methods. The skeptics have seen all of their questions researched, answered, checked and rechecked exhaustively, and the math is very clear: to continue business as usual will impose unprecedented added costs to all government spending and unmanageable risk to all areas of routine economic activity. Action to correct this catastrophic market failure is the conservative course, and it can be done without expanding government bureaucracy, without added spending, without new regulatory enforcement mechanisms and without an economic slowdown. The right carbon pricing policy can even help us eliminate burdensome regulations. The time for conservative climate heroes to step forward and do right by their country, their communities and their preferred way of life, is now. Featured image, courtesy US Navy, shows the USS Makin Island, the US Navy’s first hybrid-drive warship: part gas-turbine-electric and part diesel-electric.